Two useful routes in Vermont: north-south on US Route 7 and east-west on US Route 4. Vermont Translines, working with the Vermont Agency of Transportation, operates two intercity bus routes (map) daily in Vermont and New York state. 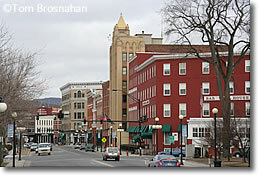 The north-south route and east-west route meet in Rutland VT, which also is the terminus for Amtrak's Ethan Allen Express train to/from New York City. The full-size motor coaches are equipped with toilets and cellular Wifi. Vermont Translines is a Greyhound Connect partner and can thus sell you Grehound Lines tickets for onward journeys to other cities. One bus daily in each direction follows the north-south US Route 7 between Colchester and Burlington VT via South Burlington, Middlebury, Brandon, Rutland (connection to Amtrak and the US Route 4 service described below), Wallingford and Bennington VT to Albany International Airport and the Albany NY Greyhound/Trailways bus terminal. This daily route follows US Route 4 from Rutland's Marble Valley Regional Transit Center via Mendon, Sherburne, Killington, Bridgewater, Woodstock and Quechee VT to White River Junction VT, then crosses the Connecticut River to Hanover and Lebanon NH. Rutland VT, where the two bus routes cross.